Vintage chest of drawers great for child’s room or beach house! Shabby chic white painted with light green knobs. 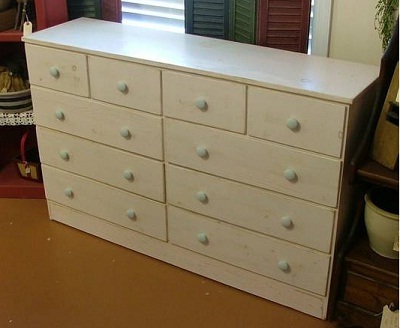 This All Wood contruction dresser has 10 drawers so there’s lots of storage space. 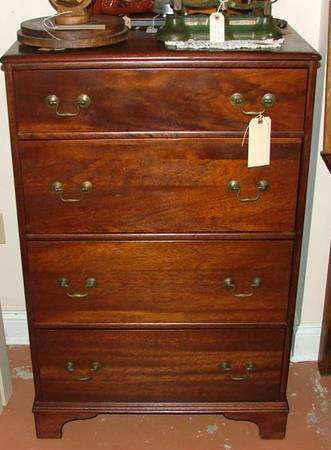 Antique tall chest of drawers. Dark Oak dresser with 4 deep drawers and brass drawer pulls. Quality heavy furniture with dovetailed drawers front and back. Measures 30″W x 20″D x 45.5″H The top drawer is divided too. 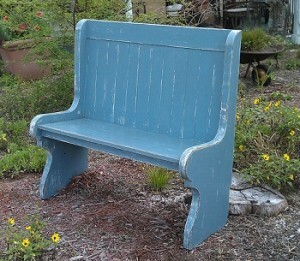 This sturdy Settle Bench dates to the early 1900s. The boards for the sides and the seat are each made from s single piece of wood. 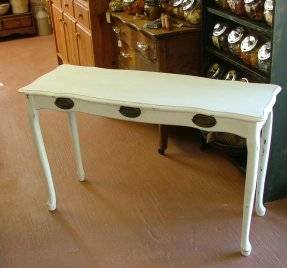 This Shabby Chic Sofa Table would be ideal for your Beach Cottage. The white paint is sanded in all the right places to give it that antique look everybody loves. Real antique Hepplewhite Handles grace the front. Protected with a hard waxed finish.